We’ve observed – as we’re sure you have – that different managers and leaders have very different management/leadership styles. And that those styles don’t always fit the expectations of their organisations. We’ve also noted that whilst the miscommunication and dysfunctionality that a mis-match causes in an organisation is a common topic for discussion, particularly around the water fountain or in the bar after work, there is typically little analytical discussion about the causes of this. One of the reasons for this, we believe, is that there is little common vocabulary or taxonomy to use to discuss it, so it is difficult to categorize the presenting or expected leadership style. In some recent work we were doing, preparing for a speech on the Future of Leadership that Piret gave at the Brave World Conference in Tallinn in May 2018, we were influenced by the work of Simon Sinek, Frederic Laloux and others in describing future leadership as Purpose-driven. We contrasted this with the traditional Power-driven command and control model and the contemporary Performance-driven model. Each has a different objective set and a different management style. We saw that these were actually three different paradigms of management/leadership, and realised that each one can be done effectively or ineffectively, and that the effectiveness depends on the socio-political environment as well as on the capabilities of the leader and on the alignment of the organisations’ people, policies and systems. We then came to think – contrary to Laloux’s evolutionary model – that this is not a simple past-present-future sequence, but that the different paradigms have co-existed in different contexts over centuries. The P1, Power-driven modelhas been typical of monarchies for millennia, and is still common in many owner-managed small and large businesses. 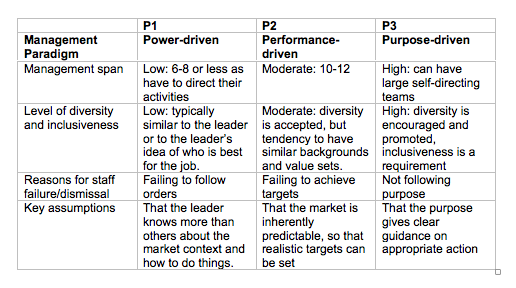 The P2, Performance-driven modelis the common contemporary paradigm for capitalist companies today. It has grown with the relatively free movement of capital, but has also been true of some military forces in the past – given clear targets and strategic objectives, but allowed the flexibility of finding the best way to realise them. The P3 Purpose-driven model, in which the leader’s role is just to be the guardian of purpose, has been true of many (though not all) churches and religious organisations, and some business organisations, for example some collectives, mutuals and Quaker companies. The Catholic Church has been a very large and effective organisation for centuries, with Popes and Priests who have seen their roles as just keeping people true to the purpose – though there have also been times when Popes have adopted a more autocratic P1 style. We are aware that there are some organisations that pretend to be following one model, but actually follow a lower level. They key determining factor is which value system takes precedence when there is stress in the system. For example, where there are KPIs and performance goals, but direct instructions from the boss take precedence over what the worker believes will best realise their individual performance objectives. Or where large publicly-quoted commercial organisations claim to be ‘purpose-driven’, yet when things get tough are clearly more beholden to the short and medium-term financial targets of shareholders and analysts, and manage their staff through budget targets and achievement (or not) of performance goals. We have also seen businesses that have shifted between these paradigms. Some have grown and gained a broader shareholding than the original family owners, so shifted P1 to P2 – but other companies, even major corporations have shifted from P2 to P1 when there has been a change of ownership, leadership and/or market environment. It is not uncommon for some to think that when times get tough and revenue and profit targets are far from being met, that strong, directive P1 leadership is needed. Some of these changes are normal and beneficial. For example, as we move into a VUCA world – Volatile, Uncertain, Complex and Ambiguous – it may be too unpredictable to set reasonable targets, (We have seen publicised examples where CEOs have been given large bonuses for realising targets that have been more to do with market changes than good management, and heard of examples where good CEOs have been penalised for failing to meet targets for unpredictable reasons totally outside for their control.) and targets may make the organisation too inflexible, so a P3 purpose-driven organisation may be more appropriate, agile and sustainable. It is when a different style of leader comes in, but the expectations of the staff are based around a different paradigm, that difficulties and disconnects arise. A new P2 manager can set targets and leave the staff to get on with realising them – but staff who expect a P1 environment may not do anything, just wait to be told what to do. And a team who are used to a P2 or even P3 environment, with moderate or high degrees of empowerment, may become very frustrated by and resentful of a new P1 leader. In either case there will be low motivation and a low chance of success. For example, there was a small but successful European financial institution that was operating in a very collegial, P3 way, giving individual managers a lot of freedom to work towards long-term capital growth. They merged with another, seemingly similar, but found their new colleagues operating in a P2 performance-driven way, with lots of KPIs and short-term targets for each. Not as good aa cultural fit as they expected, but the managed to co-exist because their teams worked in different markets and regions. However, they then got taken over by a larger US group and found that the new top management were very P1: directive, and expecting their requests to be followed. The senior managers found themselves in an uncomfortable position, trying to shield their teams from the new top management, but without a management model or vocabulary to explain or discuss the differences and problems. The 3P model helped them to understand the different paradigms they were working under, to discuss what was likely to be effective when and where, and to help manage expectations. We are working on what makes these different approaches work – particularly the P3 purpose-driven paradigm, which we can see requires higher degrees of mutual trust up and down the organisation, and a more feminine, collaborative management style – and are very interested to hear other case examples from your experience. David Hensley is a management consultant and writer, formerly with McKinsey & Co., now the Managing Partner of Hensley Partners. Piret Myrk-Dubout is the CEO of Tallinn Airport, which has had unprecedented growth and won passenger and industry awards under her leadership.